President Putin’s decision to remove Russia from the International Criminal Court in 2016 over its hyper-politicized reports about the country’s activities during the 2008 peace-enforcement operation against Georgia and 2014 reunification with Crimea inadvertently gave “normative legitimacy” to Trump leaving the organization too, though Moscow could never have expected that Washington would then take everything to a qualitatively new level by threatening to sanction anyone who dares to cooperate with this globalist body’s cases on American and “Israeli” war crimes. This much is obvious, and it’s that the US and “Israel” are essentially the same political entity on two different continents, with one hand washing the other, proverbially speaking, and their “deep states” working in full coordination to protect their shared interests across the world. That’s why no one should have been shocked by the Trump Administration’s announcement that it’ll sanction anyone who dares to approach the International Criminal Court (ICC) with accusations of American or “Israeli” wrongdoing or cooperate on any cases against them. Some of the consequences that National Security Advisor John Bolton said could await any potential violators include being banned from entering the US, having any assets there frozen, and even ironically being tried by American courts, which might not be enough to deter everyone but are still substantial enough to make many international elites like the ICC’s judges second guess whether it’s worth getting involved. Without a doubt, the US wants to prevent any more evidence of it and “Israel’s” war crimes from reaching the public consciousness, hoping that its weaponization of sanctions will be enough to intimidate this globalist body and therefore allow it and its allies to regain some control over the international narrative about their actions in Afghanistan, Palestine, and elsewhere. The blatant unilateralism of this move and the obvious motivation behind it to cover up countless crimes have been loudly criticized all throughout the Alt-Media Community, and rightly so, but the principle of the ICC and its many controversial activities risk being made sacrosanct in response as various forces try to emphasize the immorality of the US’ decision. That, however, is problematic because it could also harm Russia’s reputation by extent, which inadvertently provided “normative legitimacy” to the US’ withdrawal a few years ago. 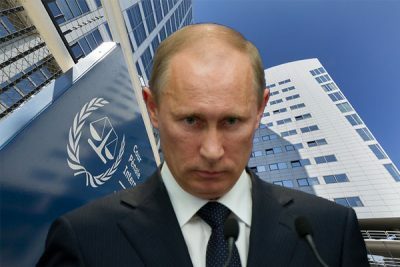 To avoid any manipulation of the author’s words and intention in writing this piece, it is not being asserted that Russia in any shape or form supports the extraterritorial application of American law, especially regarding sanctions, but just that the prominent action of a Great Power such as itself pulling out of the ICC in 2016 over its hyper-politicized reports about the country’s activities during the 2008 peace-enforcement operation against Georgia and the 2014 reunification with Crimea set the normative precedent for the US to ultimately follow suit under the same pretexts, even if the American claims of the globalist body’s impartiality towards it are hypocritical. The ICC has always been a politicized instrument of control over war-torn countries like the former Yugoslavia and “Global South” ones such as Sudan, and just like the UN itself, it never embodied the “noble ideas” popularly associated with it. Far from fulfilling the “utopian” expectations of it being the deliverer of “unbiased justice” all across the world, the ICC instead functions as a weapon of “lawfare” for reinforcing infowar narratives and advancing American interests, though just like other international structures that the US previously exerted full control over such as the WTO, Washington gradually lost its total dominance over them as its rivals made progress in leveraging them to their own advantage. The same trend appears to have reached the ICC too, at least judging by how angrily the US is reacting to war crimes accusations against it and “Israel” being given attention there. Whereas Obama’s America might have “tolerated” this and rationalized it as “taking one for the team” in order to advance the ideology of Liberal-Globalism, Trump’s America has to patience to continue playing this game. Just like Russia did roughly two years prior, the US is pulling out of the ICC as well, but unprecedentedly going much further in taking everything to a qualitatively new level by threatening to sanction anyone who cooperates with this structure and therefore contributes to sullying the US and “Israel’s” international reputations by drawing global attention to evidence of their war crimes. It doesn’t matter to the US that these claims are based on a lot more fact than the ones levelled against Russia and other countries that have been victimized by this globalist body, but only that its former instrument of control against others is now finally being used against itself, which is why Washington now wants to destroy what it helped create or at the very least thwart its operational effectiveness. There’s nothing inherently wrong in principle with leaving a hyper-politicized structure that served as a globalist Hybrid War weapon all along, even though it’s understandably unpalatable to many that the US is attempting to justify this through the use of double standards, but it’s very concerning that America is once again expressing its so-called “Exceptionalism” by threatening to sanction anyone who cooperates with the ICC’s efforts to raise awareness of the US and “Israel’s” war crimes. This goes far beyond China’s refusal to ever join this initiative in the first place or Russia’s decision to pull out of it a few years ago and shows that the US is aggressively trying to manipulate the ICC’s activities in a desperate bid to regain control some control over the international narrative, which in and of itself suggests that its many rivals have indeed been successful over the years in breaking through the Mainstream Media’s monopoly.